Includes: flight in and out from Fort Frances, Ontario, all meals and modern accommodations, boats, motors, gas, and boat equipment. Includes: airfare, fully equipped housekeeping cabin with indoor toilets and shower, all amenities of the lodge, boats, motors, gas, and boat equipment. Includes: airfare, fully equipped modern cabins with indoor shower and hot water, sleeping bags with liners, boats, motors, gas, life jackets, minnow buckets, and maps. Extra costs accrued on the trip are: Harmonized Sales Tax ( 6.5% HST), tips, beer, bait, tackle, fishing licenses, and miscellaneous purchases made at the lodge. Moose Point Lodge and Outposts enforce a catch and release program. Fish may be consumed while at Moose Point Lodge and Outposts but none may be taken home. 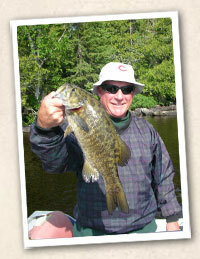 Possession and size limits are: 2 walleye under 18 in., 2 northern under 27 in, and 1 smallmouth under 13 in. until June 30 then 2 under 16 in. Limits are subject to change per Ontario regulations. We will be happy to arrange replica mounts. Unguided guests are responsible for damaged outboard motors. A $60.00 fee for props and a $350.00 fee for lower units or more may be assessed. For $15 per person we are offering an insurance program covering props. The lower units are also covered, however their is a $100 deductible. Everyone in the party must take insurance to be covered. Please travel as light as possible. We allow 50 pounds per person for trips to the lodge and 100 pounds per person for outpost, and light housekeeping trips. We reserve the right to charge $1.00 per pound of excess baggage. Excess baggage will come in when room on airplanes is available. We require a $450 per person deposit to confirm and hold reservations for American Plan trips and a $300 per person deposit for outpost trips. In the event of a cancellation the deposit will be applied to the rest of the party. If the whole party cancels we will not refund the deposit. Personal checks are fine for deposits, Final payment should be made in cash, cashiers check or travelers check unless other arrangements have been made. Food packages are available for outpost and light housekeeping guests. Bring your groceries with you or let us take care of the hassle. Call for details. 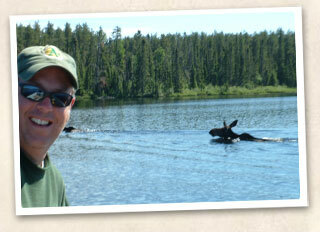 Please visit our website at www.moosepointlodge.com email moosepoint@nconnect.net. We can be reached from September to May at: phone 262-677-8397, cell 414-659-2805. From May to September please phone the lodge at 807-934-6924. Moose Point now has satellite wireless internet. If you have a wireless notebook you can stay connected. This also means we can receive email year around at moosepoint@nconnect.net.